The Ravens sent them home disappointed. Javorius Allen had two touchdowns and Baltimore held Denver scoreless in the final three quarters en route to a 27-14 victory Sunday. "The story of that game was basically resilience, relentlessness, character, heart, and I am proud of the players for what they did," Ravens head coach John Harbaugh said. "Our coaches stayed aggressive the whole game on both sides of the ball. But our players are just special guys." The Broncos (2-1) lost seven road games last season and are 0-1 this year. The team traveled to Baltimore on Saturday instead of Friday, but that did not prove to be an effective plan. Denver appeared to wear down on a wet, humid afternoon. A slew of careless penalties also hampered the Broncos. "You're playing a tough Baltimore team on the road and you have 13 penalties for 120 yards and it really honestly cost us 20 points out there," Denver head coach Vance Joseph said. "So that obviously killed us today." The Ravens' revamped passing attack was not impacted by the elements and continued to make game-breaking plays. Baltimore has scored touchdowns on all 12 trips in the red zone this season. The Ravens have been able to achieve that success with a perfect mix of running the ball and passes from quarterback Joe Flacco. That balance has been key in both victories this season. Flacco was 25-of-40 for 277 yards with a touchdown. He improved to 17-2 at home in September with 32 touchdowns and eight interceptions in his career. Receiver John Brown had five catches for 89 yards. Allen scored on a 12-yard reception and a 1-yard run. Meanwhile, Denver struggled against an aggressive opponent and lost its composure several times. Running back Phillip Lindsay, who was the first undrafted rookie to amass 100 yards or more from scrimmage in his first two games, was ejected for throwing a punch in the second quarter. The Ravens also did a solid job neutralizing Denver linebacker Von Miller, who was held to two tackles and no sacks. Baltimore's tight ends did a solid job supporting the offensive line to contain Miller, who also had two penalties for neutral zone infractions. "We have a lot of tough guys up front," Flacco said about his team's performance against Miller. "When you play a team like we did this week, and those guys hold up the way they did, it's impressive. "You have to give a lot of credit to Von. He's able to get in there and make plays to change the game. That was the biggest thing: not letting him be a factor." Ravens linebacker Patrick Onwuasor had an 89-yard interception return for a touchdown negated by an illegal block in the back by Matthew Judon in the third quarter. Still, the Broncos could not capitalize and were completely out of sync the entire second half. Denver entered the game with the NFL's second-ranked offense but struggled against the Ravens' tenacious defense that was playing without Pro Bowl linebacker C.J. Mosley (knee bruise). Quarterback Case Keenum was under pressure for most of the game and was sacked three times. Keenum completed 22-of-34 passes for 192 yards with an interception. Joseph Jones blocked a punt that set up a 6-yard touchdown run by Royce Freeman on the Broncos' first play from scrimmage. Baltimore responded on the ensuing drive when rookie tight end Mark Andrews caught a pass from Joe Flacco and leaped over a defender for a 30-yard gain. That set up a 6-yard scoring run by Ravens running back Alex Collins. A hold by Ravens safety Tony Jefferson was costly on third down. On the next play, Emmanuel Sanders ran 35 yards on a jet sweep and Denver regained the lead 14-7 midway through the opening quarter. "Talk about a resilient group. We started bad," Baltimore safety Eric Weddle said. "Once we settled down, the defense played lights out." 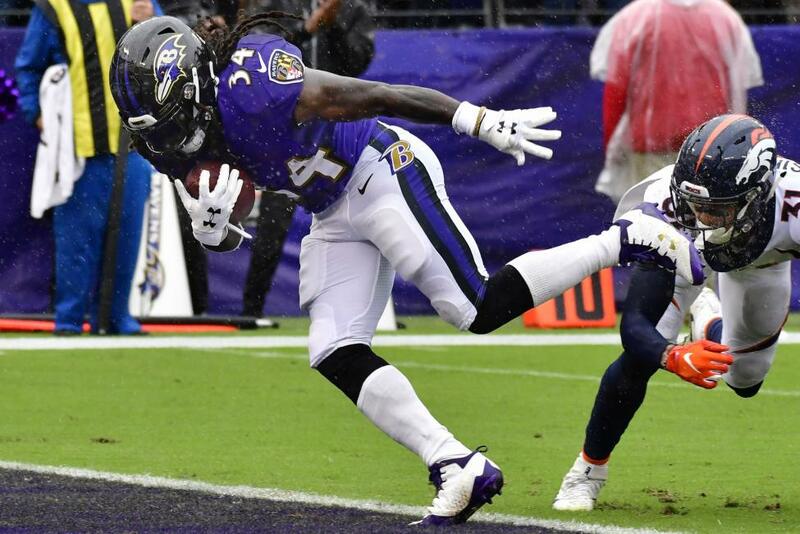 Allen gave the Ravens their first lead at 17-14 with a 12-yard touchdown reception from Flacco. From there, Baltimore stayed in control. Denver cornerback Tramaine Brock was ruled out with a groin injury.